Šri Shanmukha along with Šri Valli and Šri Devasena, His consorts. Šri Shanmukha is the younger son of Šri Šiva and Šri Pãrvati, and the younger brother of Šri Ganeša. Since He is looked upon as the Lord of warfare, He holds a flag with a rooster as His emblem and also holds a divine spear, which was given to Him by Šri Pãrvati as both a weapon of war as well as one that imparts wisdom. He therefore inspires valor, courage and wisdom. ŠRI MAYURA, THE DIVINE PEACOCK : The faithful peacock facing Šri Šhanmukha is Šri Mayura, His Divine vehicle. Behind Mayura is the Bali Peetha, where offerings to the Lord are placed. 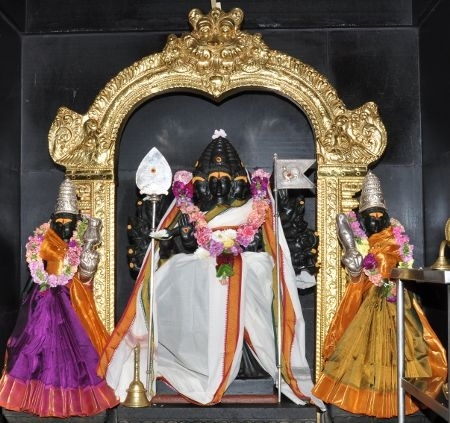 Šri Valli Devasena sameta Subrahmanya (utsavar), Šri Arunagirinãthar : In the wall enclosure, sits the utsava vigrahas (festival idols) of Šri Shanmukha with Šri Valli and Šri Devasena. There is also the idol of Šri Arunagirinãthar, who was a 15th Century Tamil saint- poet and an ardent devotee of Šri Shanmukha. We pray to Šri Shanmukha by singing the devotional songs written by this great poet-devotee who inspires us to become a devotee like him and hence the place for him in the same sanctum.